The tester (circuit meter) is designs the electrical circuit and the electric circuit, and an indispensable measuring instrument for production and the repair. The direct voltage, direct current, the alternating voltage, and resistance, etc. can be generally measured by operating the changing-over switch. There are the analog one and the digital one. 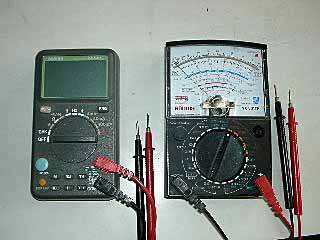 DA-54LS digital multimeter of Sanwa that I am using It is YX-361TR analog tester of (left) and Sanwa (right). Special high-level goods are not necessary for the repair etc. I think that I use an analog tester easily than a digital tester. It is not understood at all that the value changes in digital. If it is analog, it might be predictable in how of the needle to swing. When the capacity of the electrolytic condenser is seen with the ohmeter, it is impossible if it is not analog. It might be earlier to be analog at time until measurements are displayed. The measurement cooking stove might be not steady, and I think that the response is generally late of digital. An analog meter combines a moving coil and a permanent magnet and is made. When the current flows to the moving coil, the indicator is shaken by the balance of power of the interaction and the spring of magnetism with the coil and the magnetism of a permanent magnet. Therefore, only direct current can be measured only by this meter. It rectifies with the diode to measure the exchange, it converts into direct current, and it measures it. The ammeter of high sensitivity is very used for this meter. A lot of resistors are connected around the cooking stove switch switch. The purpose of it is to measure a current a lot of branch [sasete], and to measure it as a voltmeter by connecting the resistor of a large value with the series and decreasing the current to the meter in the resistor as for the current that has flowed from the measuring terminal. It is a circuit to measure resistance composed of the battery and the resistance built into the ammeter and the tester. The measurement thing is passed an electric current with this battery and resistance is measured. The tester can generally measure the direct voltage, direct current, the alternating voltage, and resistance, etc.The exchange current cannot be measured with a usual tester though there is the one that the exchange current can be measured in the inside, too. The cooking stove is made a cooking stove corresponding to the voltage that tries to be measured by direct voltage DC[V] or alternating voltage AC[V]. It connects it with the terminal of ..minus (-).. ..red of tester stick.. ..plus (+).. display of the black of the tester stick to the terminal of the display (It is at the COM display). Red of the tester stick is connected with one with high voltage, and the black of the tester stick is connected with one with low voltage for direct current. Both are not cared about at the exchange either. When it is not easy to read it, the cooking stove switch is done. After the connection of the tester stick is removed at this time, it does. The cooking stove is made a cooking stove corresponding to the voltage that tries to be measured in direct current DC[A]. It is noted that the terminal that connects the tester stick is different according to the tester at a large current. The measured circuit is separated, red of the tester stick is connected with the flow of the current, and the black of the tester stick is connected with the flow of the current. In a word, it inserts in the circuit and the tester is inserted in the series. Never connect the tester stick by the same sense as the voltmeter. A large current flows when connecting it just like the voltmeter because it is an ammeter and the meter breaks. The cooking stove is switched to resistance [OHM]. The cooking stove that the resistance that tries to be measured at this time is in the vicinity of the center of the meter is chosen. 0-ohm regulator is adjusted so that the black of the tester stick and red of the tester stick are short-circuited, and the indicator may indicate 0OHM. Because 0-ohm adjustment shifts when the cooking stove is switched, it readjusts. The tester stick is connected with the place where it wants to measure resistance. When resistance is not removed and measured, the power supply of the equipment is put into the state cut without fail. The battery is removed for the equipment using the battery. Never connect the tester stick by the same sense as the voltmeter. A large current might flow when connecting it just like the voltmeter because the resistance cooking stove is the same basically operation as the ammeter and the meter break. It is the one that can be used for various usages if the tester not only is made an original usage but also it devises it. I think that it might be faster the response of an analog tester, judge by the swinging condition of the needle, and use it easily for such a usage of this though it is possible to do also with a digital tester. 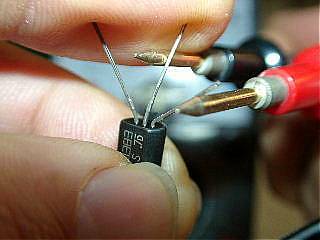 The quality of the diode and the transistor is judged by the tip of the resistive measurement. The transistor and the diode might be able to be judged and to judge these qualities by measuring resister with an analog tester. The current flows from the anode to the cathode in red of the tester stick (The voltage of the minus has gone out) for the diode (LED is also the same) if the cathode and the black (The voltage of the plus has gone out) are connected with the anode because the current flows from P type semiconductor to N type semiconductor. The current doesn't flow in the opposite. LED lights by the current of the tester when an appropriate cooking stove is selected. When the voltage of the battery of the tester is lower than this because the voltage of directions of easy flow is at least 1.7V or more necessary, this measurement cannot be done for LED. Please note that there is the one for which the voltage of directions of easy flow of LED is 3V or more necessary, too recently. Because the current flows from P type semiconductor to N type semiconductor, I understand the base for the time being for the transistor. The collector and how to distinguish the emitter do as follows. It explains as an example of the NPN type (2SC and 2SD type). The tester is made about 1000 time resist cooking stove. A black stick (The plus has gone out of the voltage) of the tester is applied to the foot that seems that a collector it, and a red stick (this minus) is applied to the foot that seems that an emitter it as shown in the photograph. It touches between the foot and the base that seems that a collector it by the finger. If the needle of the tester swings more widely than the time usually applied only to the finger, the assumed foot is a collector and an emitter. The PNP type reverses the color of the tester. As the application, it is possible to use to look for becoming complete hfe as it looks for hfe large, and it is possible to identify it simply from among transistors how many. The transistor understands and whether it is alive or dead is understood. I am always before using the transistor. I do not think that it knows and there is a disadvantage. This forms an easy amplifying circuit by using resistance the power supply of the tester and in the tester. The finger between the base and the emitter assumes the human body to be resistance and throws the current of the use base. I think that I use the analogue easily for the tester. SCR and MOS-FET can be checked with the tester. Because the explanation is troublesome, it doesn't write here though there is a thing that thyristor (SCR) and field-effect transistor (MOS-FET) can be checked with the tester, too in reality. Please think independently. The capacity omission and the insulation of the electrolytic capacitor have been judged by the tip of the resistive measurement. The capacity omission of the electrolytic capacitor can be judged only with an analog tester though there is the one that the capacity of the capacitor can be measured in a recent digital multimeter, too. An analog tester is made a high cooking stove of the resistive measurement, and it applies it to the electrolytic capacitor. The needle swings momentarily and it returns to the origin. Capacity can be presumed by the swinging condition of the indicator. It is possible to do even by degrees how many by replacing red and the black of the tester stick. It understands well if it compares it with a new thing. The stick with a red tester becomes in the minus terminal of the capacitor and a steady instruction value when the stick with a black tester is applied to the plus terminal of the capacitor becomes the insulation resistance of the capacitor. The larger this value is, the better as the capacitor. The tester is used as a galvanoscope by the tip of the amplitude measurement. The voltmeter of a recent tester also is large internal resistance, and has the one of about 50kOHM/V. When it is 1000V cooking stove, internal resistance becomes 50M OHM. Internal resistance is 5M OHM in 100V cooking stove. If it is this, it is possible to use it as a galvanoscope with 100V-1000V cooking stove of the voltmeter. The needle of the tester swings if this is a voltage side (Hot side) if a red stick is inserted in the outlet of 100V with the black of the tester stick by the hand in a word for instance. It doesn't swing on the earth side (Cold side). Both both needling swings if it is 200V. However, self-responsibility of this, please. Do not use it in the voltage of 150V or more in the voltage of ground for safety. Moreover, do not neglect the attention of the limit in case of being on a carpet and a futon dry as it puts on shoes and slippers with a good insulation. It is needed to know whether the electric wire is hot or cold at electrical work. It doesn't know and the incompetent constructed or there is occasionally a case that doesn't become the street though a hot side (black) and a cold side (white) are classified by the color of the electric wire. Moreover, the classification is not done to begin with in [i] wiring of corresponding old.